Visitors to Corsica do not usually come for the shopping but this does not mean there are not some delightful stores and stalls for casual browsing and gift buying. 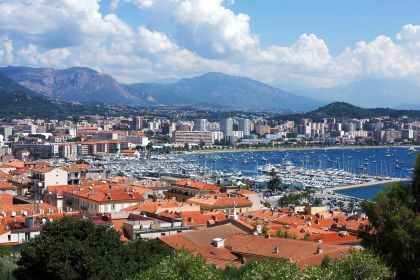 In Ajaccio, there are high-end designer boutiques with the latest fashions, while everywhere else on the island you’ll find beautiful handmade leather items and high-quality knives. And of course, don’t forget local cheeses, honey, olive oil and wines. You’ll find a diverse selection of wines in La Cave du Cardinal in Ajaccio’s centre. Corsica’s food is flavourful and abundant. Chez Edgard in Lavatoggio, for example, is highly recommended for meat lovers; Terra Cotta in Propriano is a seafood-lover’s paradise; Restaurant Les Quatre Vents in Bonifacio serves a memorable bouillabaisse, while A Nepita in Ajaccio seduces with its well-deserved Michelin star. 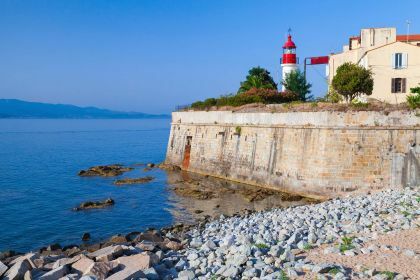 Of course Ajaccio is not just a foodie destination. The pretty seaside town is easily explored on foot, is blessed with a quaint harbour — sailboats and fishing vessels moor in the Tino Rossi port — and oodles of things to see and do. 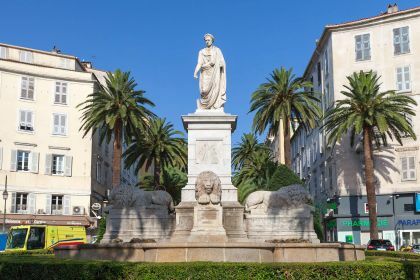 Many of Ajaccio’s streets are named after Napoleon Bonaparte, born here on August 15, 1769, a few months after the French claimed Corsica after being ruled for more than four centuries by the Genovese. Now the national museum Maison Bonaparte pays tribute to his historical influence. Explore the old town around the imposing citadel and watchtower. There are numerous historical sites, narrow, atmospheric streets, museums and churches. There is even an art museum, which boasts the largest collection of Renaissance paintings outside of Italy. Good options for beaches include St Francois Beach, just a 10-minute walk from the port, Plage du Picanto or Plage du A’riadne at Villanova. The best thing top do in Ajaccio though is to just walk and get lost. It’s small enough to easily move around on foot and breathe in the atmosphere. Make contact with us, and we’ll make sure you get the most from your yachting holiday. We are here to help you plan every last detail of your memorable adventure.